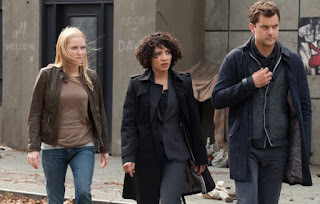 Beyond Fandom: Fringe 501 Review: Can we fight this future? Fringe 501 Review: Can we fight this future? Last season, Fringe took us into a future that was bleak, dystopian, and surprisingly controlled by the Observers. Longtime fans of the show know the Observers quite well but they were always less menacing overlords than they were cryptic well, observers, of the human condition. Things had dramatically changed by the year 2036 where least season’s nineteenth episode, ‘Letters in Transit’, introduced us to a young member of the FBI called Etta who first rescued Walter Bishop after he’d ambered himself years ago back when the Observers arrived. Together they also found and freed Astrid and Peter—Etta’s long-lost father, at the expense of Etta’s own partner Simon (Lost alum Henry Ian Cusick). Olivia was nowhere to be found then, but that was just our first glimpse into this brave new world—now in the fifth season we’re living through it . In last night’s episode, ‘Transilience Thought Unifier Model-11’, the beginning of the end of Fringe played out entirely in 2036 where the producers have said we will remain through the season as the final thirteen episodes fit together in one perfectly serialized arc. Much of how the world has been changed since the Observers took over has been revealed and there’s some clever instances of world-building that the show must be praised for. For example, in a world where the Observers have dehumanized the people of this planet it makes perfect sense for this attitude to be found in the people themselves against the unlucky souls who, for one reason or another, were trapped in amber. There’s such a thing as ‘amber gypsies’ people who rob the living graves of those that were ambered by cutting out the encased human beings from the overall amber fixture to sell them on the black market as human furniture. The hunt for Olivia led our group to a black market that deals in ambered people and, when they found out who purchased her, to one of what will no doubt be many familiar faces this final season when an aged-up version of recurring character Markham appeared. When Olivia is freed from the amber she finally gets to be reunited with the little girl we watched she and Peter lose on an idyllic day back in 2015 in the cold opening when the Observers first came and chaos ensued. There were a number of tricky things to handle here with this scenario as our perspective of Peter Bishop and Olivia Dunham needs to be able to shift for us to be able to view them both as parental figures to Etta—being stuck in amber also means they don’t get the added benefit of makeup to age them up to give them the cosmetic advantage of looking more parental. It's not an issue though as Anna Torv and Joshua Jackson both capably express the twin emotions of joy and pain that you’d expect to see from two people who had their lives as parents (as well as their own happy relationship) stolen from them. 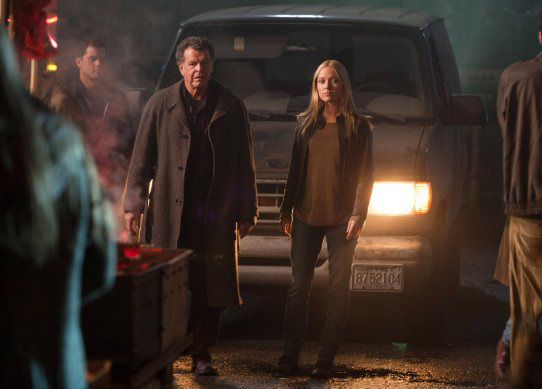 Peter Bishop, Walter Bishop (John Noble) and Etta Bishop on a family outing to the black market. Casting grown-up Henrietta was crucial and though we saw that Georgina Haig was a fine actress last season in her introduction to the series, this year we’re going to be spending much more time with her as one of the new leads so the question here is can she pull it off? Judging from this episode, absolutely she can. Haig channels the right mixture of vulnerability and fierce determination that you’d expect from Olivia and Peter’s offspring—it doesn't hurt either that when you close your eyes and just listen to her speak she sounds an awful lot like her mother in voice alone. Once the band is back together, minus Walter who was captured and taken to the Observers known as Windmark for interrogation, their new challenge consists of finding Walter and finishing the work they apparently started before the ambering. It takes an Observer to beat an Observer as it was fan-favorite September who years ago supplied Walter with the methods he’d need to bring his own kind down and save the people of Earth. This is where things got delightfully Fringe-y when we were let in on how they kept the Observers, who are telepathic by their very nature, from discovering these plans. September scrambled the necessary notions and memories in Walter’s mind so that if caught he could not be ‘read’ and the plan discovered. Olivia was helping Walter carry this plan out by locating a part of a device when she was trapped in the amber. The thing that stuck out the most about this episode is that despite the futuristic trappings and the very serious threat the Observers pose toward the efforts our heroes—much of this plot was Fringe doing business as usual. Breaking it down into broader terms we had an imminent threat that needed to be stopped, a mysterious device that could stop it, a rescue mission and everything seemingly relying on one member of the team to get the job done. Walter may have the plan somewhere in the inner recesses of his mind but it’s worth noting that back in 4.19 we learned that the Observers cannot read Etta’s mind. To an occupying force that relies so heavily on invading the thoughts of the population that makes her incredibly dangerous to their plans. So I imagine it’s going to come down to either Etta or Walter Bishop to save the world this time out and right now it could be either. Etta and Walter Bishop on the hunt for the missing Olivia. For the sake of having a truly triumphant overall arc during Fringe it would be excellent were it Walter who managed to save everyone. Especially after viewing his brutal torture at the hands of one of lead Observer, Windmark; there truly is no greater victim or savior in the whole of Fringe than Walter Bishop’s brain. It has been put through the wringer metaphorically and literally throughout the series and now it seems he may yet have the key to unlocking a plan to defeat the Observers but nothing ever comes easy to Walter Bishop. 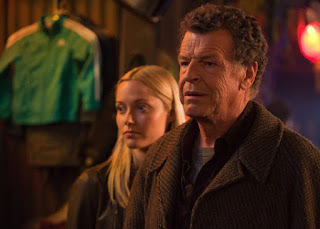 Watching John Noble portray Walter’s utter emotional devastation at being incapable of helping the world (yet) was another high mark in Noble’s portrayal of this compellingly complex character. As was the beautifully-staged final scene of the episode where Walter was reunited with the one thing his captor admitted to having no understanding of and thus the power within it: music. Walter Bishop and music are as inseparable as Walter Bishop and Red Vines but music time and again has fueled Walter to greater cognitive heights as we've seen throughout the seasons. Choosing to end the episode on a notion of finding hope when all truly seems lost, and perhaps hint that Walter hasn't completely lost what he needs to help save the world was an excellent decision. No matter how dark Fringe gets it’s definitely a show that knows that the power of hope is a something that can do more than inspire the imagination it can win wars, and it makes me think that somehow our heroes can fight this future and they can win.